by Hewitt, Paul G.; Suchocki, John A.; Hewitt, Leslie A. For one- or two-semester physical science survey courses for non-science majors. 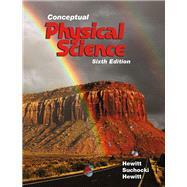 Conceptual Physical Science, Sixth Edition, provides a conceptual overview of basic, essential topics in physics, chemistry, earth science, and astronomy with optional quantitative analyses. The authors focus on concepts before computations. With its clear, friendly writing style, and strong integration of the sciences, this book connects well with all students. MasteringPhysics™ from Pearson is the leading online teaching and learning system designed to improve results by engaging students before, during, and after class with powerful content. Ensure that students arrive ready to learn by assigning educationally effective content before class, and encourage critical thinking and retention with in-class resources such as Learning Catalytics™. Students can further master concepts after class through traditional homework assignments that provide hints and answer-specific feedback. The Mastering gradebook records scores for all automatically graded assignments while diagnostic tools give instructors access to rich data to assess student understanding and misconceptions. Conceptual Physical Science, 6th Edition is also available via Pearson eText, a simple-to-use, mobile, personalized reading experience that lets instructors connect with and motivate students – right in their eTextbook. Learn more. Former silver-medal boxing champion, sign painter, uranium prospector, and soldier, Paul began college at the age of 27, with the help of the GI Bill. He pioneered the conceptual approach to teaching physics at City College of San Francisco. He has taught as a guest teacher at various middle schools and high schools, the University of California at both the Berkeley and Santa Cruz campuses, and the University of Hawaii at both the Manoa and Hilo campuses. He also taught for 20 years at the Exploratorium in San Francisco, which honored him with its Outstanding Educator Award in 2000. John is the author of Conceptual Chemistry as well as a co-author (with Paul and Leslie Hewitt) of Conceptual Physical Science Explorations. John obtained his Ph.D in organic chemistry from Virginia Commonwealth University. He taught chemistry at the University of Hawaii at Manoa and then at Leeward Community College. In addition to authoring textbooks, John is currently an adjunct faculty member at St. Michael’s College in Coldchester, Vermont. Leslie is also coauthor of Conceptual Physical Science Explorations (with Paul and John). After obtaining her geology degree at San Francisco State University, Leslie’s interest in teaching broadened to include educating elementary and middle school students. She completed additional graduate work in geography and education, receiving her California State Teaching Certification, also from San Francisco State University. In addition to writing, she devotes considerable time and energy to bringing science education to young people in engaging ways.